Flow Requires Full Attention | Mediterra - Swim & Run Better Than Ever! This continues from Part 4 of our discussion of Mihaly Csikszentmihalyi’s eight “characteristic dimensions of the flow experience” outlined in his book The Evolving Self. The first two features of flow had more to do with planning what your training will focus upon and planning what to do in each practice. These next two features are about what you will actually do while in the act of swimming. #3 – Action and awareness merge; one-pointedness of mind. #4 – Concentration on the task at hand; irrelevant stimuli disappear from consciousness, worries and concerns are temporarily suspended. 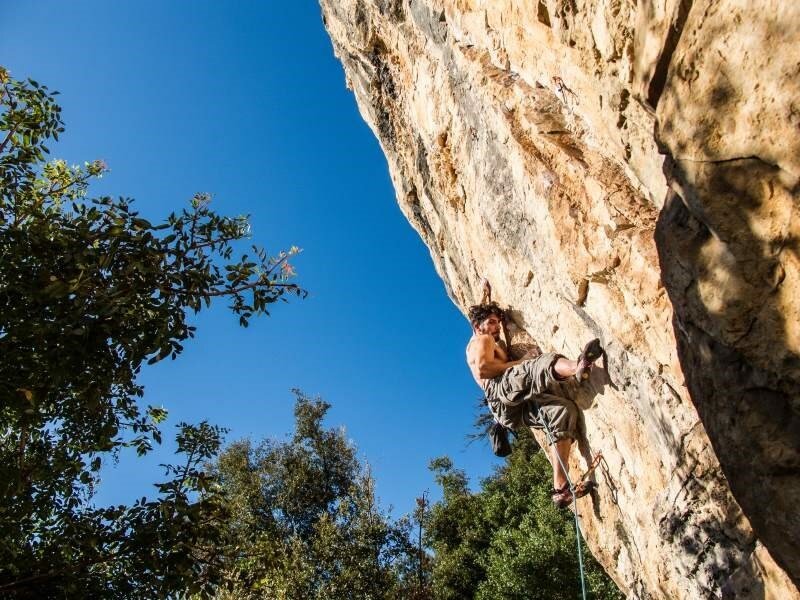 What I and perhaps most addicts love about rock climbing is that the whole situation essentially forces you into flow state (if you avoid the “panic!” option). When the brain knows that falling from height is imminent it forces all systems to divert effort to the task of staying alive on that wall. Energy starts flowing and the mind zooms in to a single life-preserving task. It is wonderfully refreshing because every other concern in the world disappears instantly. Many years ago at one of the more painful periods of my life, I would go climbing to get some rest for the mind and heart, if only for a few hours. It was a guaranteed respite. This is because the human brain is wired to be afraid of falling from heights and this triggers a cascade of mind and body focusing programs. But what about in water? There is a land-mammal program inside that strongly urges the human to keep the head up out of the water. But once a human swimmer has removed the program for ‘fear of drowning when the face is submerged’ there is no longer any primordial program ready to force our body and mind into this flow state of single-pointed focus. Since survival is no longer an issue for the land-mammal-become-aquatic, we have to rebuild an approach to flow around another self-motivating (intrinsically rewarding) objective. When we become more skillful at positioning the body in water, at moving the body through water, at maintaining precision at higher intensity or longer duration, it feels better and then we perform better; this is immediately rewarding in how it feels and it provides a long-term, compounding reward by what it enables us to do. This positive sensation in the body corresponds to a healthier body – the joints and tissues working in a cooperative, restorative way that promotes longevity, rather than feeling stress and conflict in movement which corresponds to break down and premature wear-and-tear. When the body and mind are working well we feel eager to train more frequently (each week) and indefinitely (over the years) – and this sets us up for higher and more consistent performance for a lifetime. That’s why in Total Immersion we treat swimming primarily as a skill-building activity rather than merely a fitness-building activity (the secondary objective). To set up your mind to tap into Flow while swimming you set up each swim practice, each series of practice, to work on improving certain, clearly defined, precise qualities (technical and sensory improvements) within certain quantities (distances and times). In the act of swimming – as opposed to just looking at a watch after you finish the repeat – you occupy your attention with the few necessary measurement tasks for that practice set – it may be any combination of body-sensing, ‘water-sensing’, sending instructions (via focal points) to a point in the body, counting strokes, maintaining tempo with a Tempo Trainer. You need enough tasks to fully occupy the attention – leaving no room to wander to matters outside your lane of the pool – while not so many tasks that it overloads and causes you to feel negatively stressed and chaotic. Too much load is counter-productive, and too little is not improving your skill. Early on in your practice you may feel like you can handle just one or two small focal point tasks while doing whole strokes. Later on, those who are more experienced may feel like they can handle three or maybe four complex tasks, but that would be stretching it even for the highly trained brain. These tasks can be arranged in such a way to be relaxing and fun (such as in your warm up or cool down or pleasurable auto-pilot swim day), or very intense and require full self-discipline to enter into and sustain (such as the work that is required to raise to a higher performance level). The first step is to just develop the habit of using focal points on every single swim, whether for pleasure or for the hardest training. Occupy the mind with a clearly defined task to improve or protect some quality of your stroke – focus on some small feature of something you can control which could make your swimming even a little bit better. Then practice the discipline of respectfully ignoring everything and everyone else in the pool. You may start with just practicing this on very short repeats – from just a few strokes to just a few lengths – over and over again. From there, the sky is the limit. You can keep on going to ‘ninja level’ (as TI Head Coach Terry might call it) where you maintain and cycle through focal points and measuring/monitoring tasks for hours. And this is how time, ego and other concerns can just disappear for those hours of practice. I hear this concern for the modern age more and more among very smart people: what has happened to our ability to pay attention and hold it on a single (meaningful) thing? You know it too. There is enormous competition for our attention all the time. Not only is our productivity at stake, our happiness and satisfaction in life is at stake also. Overall, it is clear that these things screaming for our attention are not making us happier and more productive. We need new skills to master our own attention in order to rise above the distraction. The practice of developing flow state in swimming is also developing our ability to pay attention anywhere we choose outside the pool. We should not take this practice lightly, nor think it is just about swimming. It is about training our mind to skillfully and habitually tap into a higher state of awareness, which sets us up to perform better in the areas of life we want to. It all starts with training ourselves to pay attention to a few meaningful tasks and maintaining that attention to quality under gradually higher intensities and longer durations.